Thoughts on, and a place to discuss, the plot points we can't reveal in our review. I really mean it when I say that seeing Gravity on a normal-sized movie screen, instead of in the IMAX format, is not really seeing it at all. In Toronto, I caught the film on plain ol’ DCP—albeit in a very swanky hotel screening room—and walked out thinking I had witnessed a cool-looking space thriller with some insurmountable script problems. A couple days ago, I revisited it on IMAX and found myself rather dramatically flip-flopping: Suddenly the full scope of Alfonso Cuarón’s technical achievement was evident; only when stretched across the mighty canvas of IMAX does the film become the fully immersive experience it was designed to be. And in light of the near constant awe Gravity inspires in this format, its dramatic issues seem considerably less pressing. Who cares if George Clooney can’t stop telling cornball stories about his romantic exploits? He’s so doing while floating through the cosmos, against the blindingly beautiful backdrop of Mother Earth, while a camera gracefully bobs and weaves around him on a 360-degree axis. Eventually, of course, Clooney does stop telling stories. 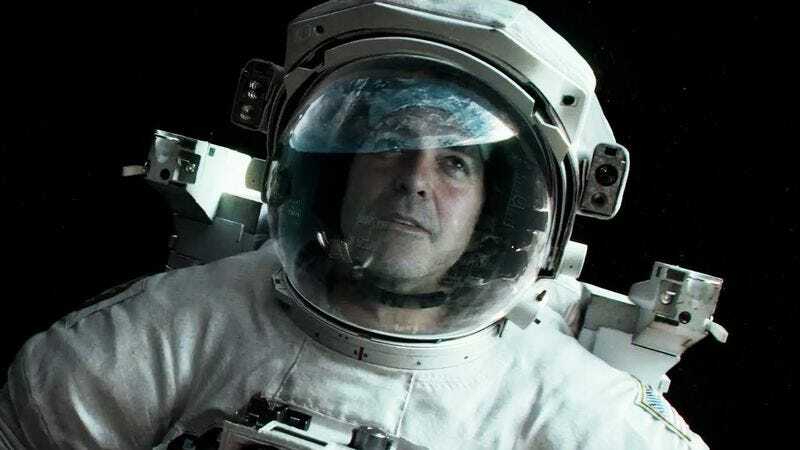 Around the midway mark, he forces fellow astronaut Sandra Bullock to let go of him, sealing his own fate but assuring that both of them don’t go drifting into the void. Excepting a brief, motivational reappearance by the movie star—he’s either a hallucination or, given the vaguely religious bent of the material, an angel—Bullock is left to carry the rest of the film on her lonesome. Though not awful in the part, the actress isn’t quite equipped for a one-woman show; that becomes clear during an extended, climactic monologue in which she pours her heart out to some ham-radio rube calling from the surface of the planet. Put a different actress in that space suit and maybe Gravity drifts into the “great” column. Then again, Cuarón could have cast Paris Hilton in the part and he’d still have one glorious-looking space odyssey on his hands.